Now that we've announced our big news (thanks so much for all your congrats! ), you may better understand our desire to save money and improve upon our home. They're two of the central themes we had when we first started the blog, but they'll be out and proud from now until November (and beyond!). One of the most obvious ways I can think of to save money is through lowering our grocery bill each week. Lately, we've been spending at least $80 for food weekly. That's up quite a bit from our old $50 goal. And now that I'm having less morning sickness, I think we can start pinching pennies again. So this week, we took some of our own advice. We sat down together for half an hour and planned out our meals for the week. We wrote down how much of which ingredients we would need. We thought about sensible, healthy breakfasts and lunches. Armed with this information, we headed to Sam's club. OK. That's something new. We're trying out Sam's Club for 10 weeks on a special promotion they are running. 10 weeks for $10 -- and if you're interested, you have until June 5th to sign up. However, after walking the aisles that first day, I don't know if we'll extend our membership beyond the trial period. We scrutinized the prices of various goods and didn't see significant savings. And much of the food there is packaged -- stuff we don't typically munch on. We left Sam's with a case of Chobani (at $1.00 per cup versus $1.19! ), two LARGE jars of peanut butter, two loaves of wheat bread, big bags of onions and potatoes, and some lemonade (which is my current magical nausea cure). The total was $51. Ack. Onto Wegmans, where our list proved to be an excellent tool. At least at getting us in and out much faster than usual. We had some higher-ticket items we needed to purchase, like maple syrup and tahini -- so the total came to $75. However, this price also included some food for a weekend meal, which goes into another budget. We're going to track our food expenditures over a month versus on a week by week basis, because I think this week's haul will be significantly less. But we'll see! Something new we're trying is making meals that last for several days. 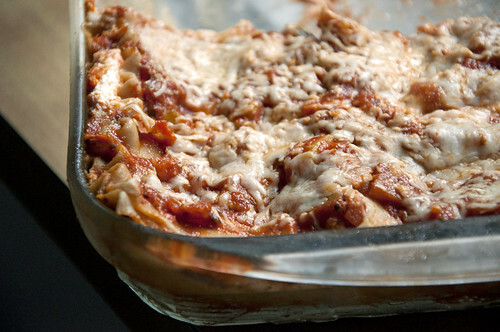 We started with this vegetable lasagna, which makes enough for 10 servings. I totaled all the ingredients we used in its creation and came up with $10. That's only $1.00 per serving, if we can spread it out over 5 days. So far, we're on day three and it's still tasting good, but getting somewhat boring. It is extremely nice to know when I go home that dinner is already prepared, though! Cook the lasagna noodles to the package directions. While you wait for water to boil, pasta to cook -- prepare your veggies. Then saute the veggies on medium-high heat for 5 minutes (or until softened). Toss in the pasta sauce and cook for another couple minutes. Switch heat to low, cover, and keep warm. When pasta is done, drain and rinse with cold water. Then in a 9 x 13 inch glass baking pan, spread 1/3 of the sauce on the bottom. Layer with 3 of the noodles (length-wise), and cover with a layer of ricotta. Then add another layer of noodles. Another layer of sauce. Another layer of noodles, etc. End your layers with a layer of the sauce/veggie mixture. Then top with some shredded mozzarella (however much you wish to use -- I think we used half a cup). And cover with foil. Cook for 45 minutes, until cheese and everything else is bubbly. 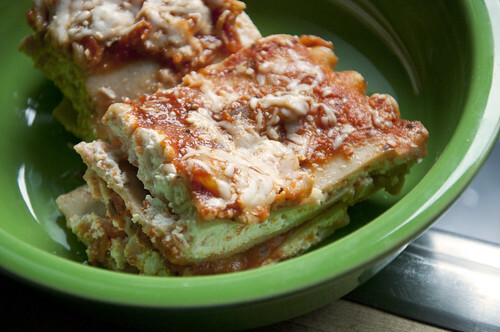 ***Recipe is straight from the box of Ronzoni Healthy Harvest lasagna noodles. Makes 10 to 12 servings. Today on (never home)maker, baby! we talk all about how we found out about the pregnancy. It wasn't all hugs and kisses, I'll tell ya that much!